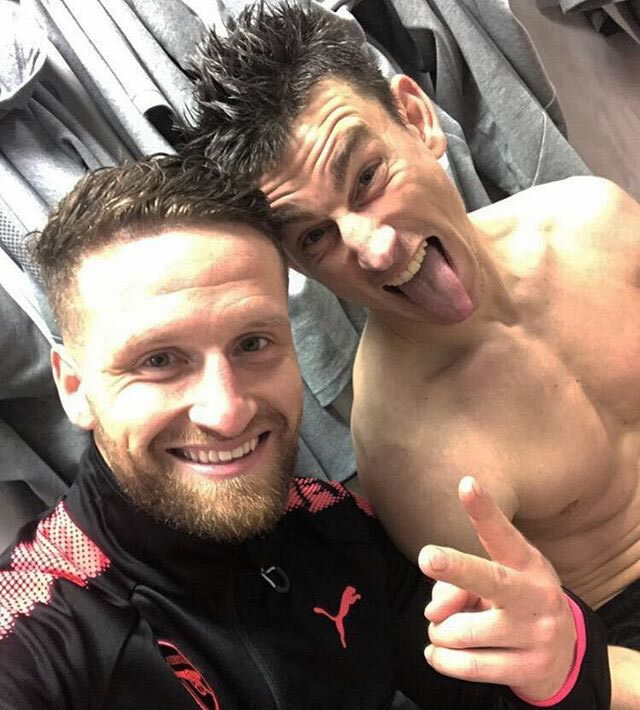 Shkodran Mustafi and Laurent Koscielny both looked pleased with themselves after having helped Arsenal keep another clean sheet to seal a 1-0 victory over Burnley in the Premier League on Sunday afternoon. After a goalless and largely uninspiring first half at Turf Moor, Arsenal were given the chance to net a late winner deep into second-half stoppage time after Aaron Ramsey was pushed in the box. Alexis Sanchez stepped up to score the winner from the resulting penalty and wrap up the three points for the Gunners in dramatic circumstances. The victory lifted Arsenal up into fourth place in the Premier League table and left Arsene Wenger’s men ahead of both Liverpool and Tottenham Hotspur in the table. And both Mustafi and Koscielny seemed to be in high spirits after having helped the Gunners to claim all three points on Sunday afternoon. Arsenal will look to make it three wins on the spin in the Premier League when they take on Huddersfield Town at The Emirates on Wednesday night. The Gunners are looking to win the Premier League title this season for the first time since their famous unbeaten triumph in 2003-04.